Why has no one told me about this little gem before? 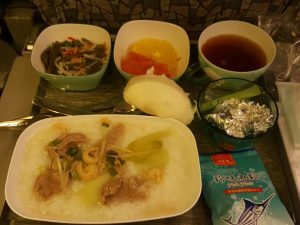 On my way to Bangkok on EVA Air, I chose the Chinese style breakfast, pictured above. Yam noodle and seaweed salad, rice bun and dried shrimp with pork and FISH FLOSS! It was a dried almost, powdery substance slightly sweet with a fish flavor of course. Added to the shrimp and pork rice dish, was muy sabroso! On this trip, no doubt there will be many posts about food, and I was lucky to start it off with something new before I even set foot in Asia :). I’m missing the kids a lot already, and know they are having a great time with daddy!